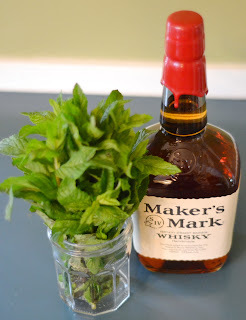 The World in My Kitchen: Mint Juleps...Better Late Than Never! 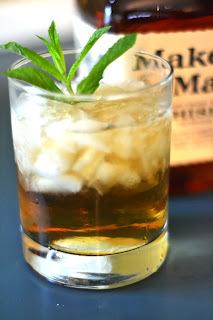 Mint Juleps are always associated with the Kentucky Derby in this part of the country, and although the Derby happened over a week ago, this beverage is a refreshing drink that can be enjoyed throughout the summer. I had had mint juleps before, but had never made them at home. This year, though, we had family from Wisconsin and California in town to celebrate my son's first birthday, so we had an impromptu Derby party. My mother-in-law made us hats out of construction paper, and I made us drinks. We all chose a horse to back and cheered them on with our homemade hats and drinks in hand. Combine the water and sugar in a small saucepan over medium heat. Stir occasionally until the sugar has dissolved. Raise the heat slightly and simmer for about 5 minutes more. Remove from the heat and add the mint. Let steep for about 15 minutes. Strain and refrigerate for about 3 hours or up to a week, covered. In a bourbon glass or a silver mint julep cup, add a little less than an ounce of minted simple syrup. Add about 1 cup of ice, bourbon and a splash of water. Add enough ice to almost fill the glass. Stir well and garnish with mint. I like your version of the mint julep Mindy. The last recipe we used muddled the mint in the bottom of the glass and I thought the drink was much too minty. I'll bookmark this for the next race. Good call on the simple syrup. I personally think that's the only way mint juleps taste good. You're right - never too late for a mint julep! Yes! That's how I like mine too, with the mint infused. My husband always tells me that I need to make the syrup like a week before and let the mint sit in it. That's the way they used to make them at the country club in his bartending days. I will take a mint julep any time of year! Battling monetarily within the past due 1960’s, the actual manufacturer had been bought through the Restricted within 1988 as well as replica chanel bags since the informal luxurious manufacturer before existing. These days, Abercrombie & Fitch manufacturer likes a broad subsequent as well as provides a powerful picture via advertising advertisements. These people launched attention grabbing magazines available on the market, focusing on first of all the actual adolescent fake gucci. Abercrombie & Fitch usually amazed through providing some thing brand new, something which might just show the standard Abercrombie is actually related to. Abercrombie may be in comparison often in order to additional custom clothes outlines for example Armani, Banana Republic, Tommy Hilfiger as well as Gucci. The actual views concerning the high quality and also the fake louis vuitton had been varied, but you which presently there lots of people faithful towards the Abercrombie manufacturer. Whilst they've the collection which suits teens, additionally they supply lots of fascinating provides with regard to dark ages individuals. Extremely fashionable as well as genuinely fake louis vuitton sale, clip-on eyeglasses will be in pattern for a long time. These types of ideal louis vuitton replica associated with shades tend to be well-liked for his or her affordable costs and will be offering exact same safety as well as comfort and ease because shades perform. There is a few timepieces that may both females and males could wear, nevertheless ladies watches normally have more design components which produce these folks exceptional for females. These Replica Chopard watches types of gold look cheap replica Fendi handbags at collections are usually sorted by simply brand, so they help you make a cost comparison as well as styles concerning common collections related to girl's timepieces. Women design timepieces may also be electronic electronic, analog, or a combination of the 2. The style centers on every single watch elements best replica watches UK such replica Balenciaga Classic handbags as the deal along with and music group, which ﻿replica Hublot watches is the reason some from the digital timepieces can turn to always be extremely female. At times the eye appeals to a lot more focus along with many obtaining unusual designs or change models. A few of the women style watches exceed the design and perhaps restricting a few features.